Central Organisation of the Workers of Sweden (in Swedish: Sveriges Arbetares Centralorganisation, SAC - Syndikalisterna) is a syndicalist trade union federation in Sweden. Unlike other Swedish unions, SAC organizes people from all occupations and industries in one single federation, including the unemployed, students, and the retired. SAC also publishes the weekly newspaper Arbetaren ("the Worker"), owns the publishing house Federativs and runs the unemployment fund Sveriges Arbetares Arbetslöshetskassa (SAAK). Its long-term goal is to realize libertarian socialism, a society without classes and hierarchies, where the means of production are owned commonly and administrated by the workers: in effect, abolition of capitalism, wage slavery, and sexism. As such, SAC is an anti-sexist and anti-militarist organization, which in 1998 also became the first Swedish openly feminist trade union. Short-term goals are improved salaries and working environments. It frequently cooperates with other libertarian socialist organizations, such as the Swedish Anarcho-syndicalist Youth Federation (SUF), although SUF is not a part of SAC. The SAC was founded in 1910 by disgruntled members of the Social Democratic LO trade union central after its failure to carry out a Swedish General Strike, and were joined by large sections of the youth wing of the Swedish Social Democratic Party, who also had come under the influence of the revolutionary syndicalism of the French Confédération Générale du Travail. In 1922 the newly formed union confederation also became founding member organization of the anarcho-syndicalist International Workers Association; however, conflicts erupted between the organizations in the 1950s as SAC set up a state-supported unemployment fund, something which the IWA regarded as state collaboration and reformist. From 1956 and onwards the SAC stopped paying its membership fees to the IWA, effectively letting its affiliation lapse. The traditional strongholds of the SAC were primarily in the forestry, mining, and construction industries. Today the majority of the union's members are employed in the public sector, often working in sectors like railway and public transports, healthcare, and education, but many of the members can also be found in the restaurant, information technology, and logistics industries. Decisions should, according to SAC, be made by those whom it concerns and not by representatives or leaders. That is why they apply federalism, direct democracy and direct action. Decisions about negotiations, notices, offensive actions and agreements are ultimately made by the members of the operational sections. Decisions about using the battle funds are made by the Local Co-organization (the members thereof, of course). Central notices about offensive action, strikes, and other things exist but they can be annulled locally by local instances. Central vetoes against conflict measures do not exist. Concentration of power is avoided by not letting SAC's employees be eligible for election to positions of confidence or as congress representatives. Most workplaces are today covered by collective agreements set up by Landsorganisationen, which apply not only to members of LO, but also other employees of the workplace in question. However, only members of LO are bound by LO's part of the agreement, which means that members of SAC - and, of course, other non-LO trade unions - are free to initiate offensive actions even if the current collective wage agreement includes a no strike clause. SAC workers conference, held in Örebro November 25-November 26, 1917. 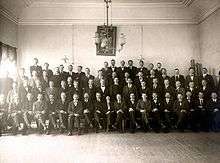 The conference decided to plan mass action for 8-hour working day in the spring of 1918. SAC has a double structure, the geographic and the industry-wise. It is influenced by the way CGT was structured at the time of SAC's founding. Local Co-organizations (Lokala Samorganisationer, LS). The foundation of the geographical structure and the entire movement are the Local Co-organizations organized as locally as possible, preferably one per city and/or municipality. Individual members of SAC are affiliated directly with their nearest Local Co-organizations. As one of the basic tenets of syndicalism is direct and local democracy, the structure of different Local Co-organizations may vary a lot. It is not common to refer to the Local Co-organization by saying "Lokala Samorganisation", instead you say "LS". Districts. Several Local Co-organizations in a geographical area may establish a district, where they can cooperate with, for example, agitation and education. Districts may also function as constituencies for some functionary positions. The Local Co-organizations that make up the district decide what the district should be doing. Central Organization. Local Co-organizations are members of the federation SAC, the name of the central authority, whose task is principally coordinating and administrative. It is from this central authority the movement has adopted its name. The highest governing body of SAC is the Congress, which is held at least every fourth year, the last being held in 2009. Representatives are sent to the congress from the Local Co-organizations, whose number of members determines how many representatives they may send. Every Local Co-organization has in advance decided how representatives should act in the questions that are to be decided on the congress, and the representatives are bound to act as such. A central committee (centralkommitté, CK) composed by members elected from the districts lead the implementation of the decisions made by the congress and may make decisions on lesser issues. An executive committee (arbetsutskott, AU) elected by the congress handles recurring matters. Between the congresses important questions and supplementary elections are made by referendums. The Local Co-organizations are independent in matters and questions concerning them only, and have their own battle funds, even though there is a central battle fund too. Operational section. The Operational section is the foundation of the industry-wise structure. These are organized at workplaces, without regards to occupation on the working place in question, and may go on strike independently of other parts of the organization if so decided by members of the Operational section. As the name implies, these groupings are to take over the operation of the workplace in the future libertarian socialist society envisioned by SAC. Syndicate. Operational sections belonging to the same industry (in example, health or transport) form syndicates in the city, municipality or other geographic area. Operational sections connected to different Local Co-organizations may join the same syndicate. Federation. Syndicates from all over the country join up to form industry-wise federations. Today, the main purpose of these is to coordinate the cooperation and agitation of the syndicates. The secretariat of SAC is located in the SAC house on Sveavägen 98, Stockholm. The closest subway station is the Rådmansgatan. The purpose of the secretariat is to co-ordinate the internal and external work of the organization. Arbetaren and Federativs are to be found in the same house.